Bingo Hideout has recently conducted a major in depth survey of the online bingo playing community; the quantitative survey has provided a unique insight into online bingo players lifestyles, their needs and habits and by asking a whole series of probing questions has provided some interesting and some might say controversial results. The completed online survey questions covered issues such as online bingo spending habits, why online bingo players choose to play online bingo, how much cash they spend playing at online bingo sites and how honest they are with their loved ones about the amount of money that they spend, as well as other probing questions. This material is copyright of Bingo Hideout. Feel free to utilize it as you wish, however any reproduction or reference requires a link back to this original resource. The Bingo Hideout questionnaire was voluntarily completed by 2,167 online bingo players, the results of which can now be released in full for the very first time. The Bingo Hideout survey provides a unique snapshot of the online bingo playing community and individual players habits, activities, hopes and dreams, and ultimately provides a huge amount of vital information for the industry. The data obtained from the Bingo Hideout survey will hopefully prove to be a useful resource, allowing bingo sites to further understand bingo players and how the industry can best serve the online bingo playing community in an ever growing market. It is important when studying the results of this survey to be aware that this information has been sourced from the online bingo population who responded to the Bingo Hideout survey and so the following statistics can only therefore provide a generalized interpretation of the online bingo population as a whole and variables in an alternative sample could occur. There were 2,167 respondents to the Bingo Hideout survey, of those questioned 100% responded to question no.1 regarding gender. 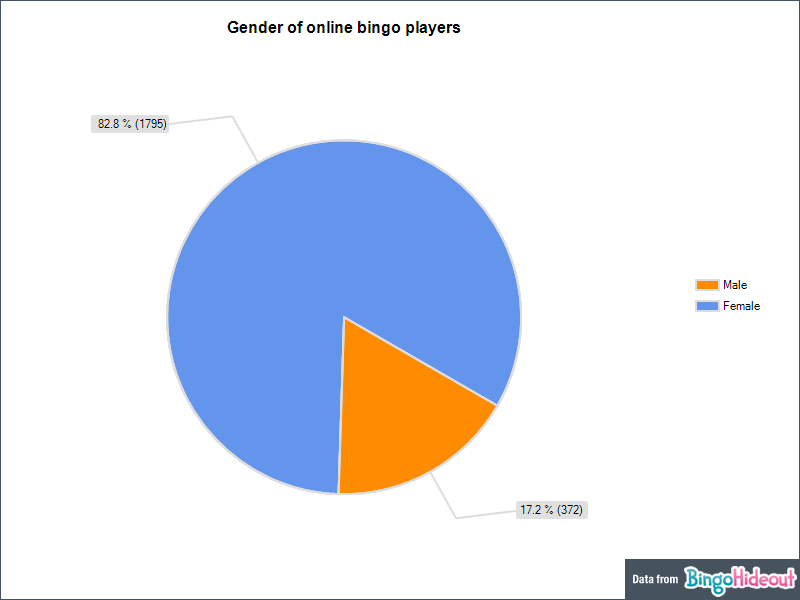 The above pie chart shows that male online bingo players represented 17.2% (372) and female respondents represented the highest proportion at 82.8% (1795). The figure for the male respondents is slightly higher than the figures published in the online bingo statistics section on Wikipedia, this states that male players account for only 15% of total online bingo players, which if correct would imply that male online bingo players are on the increase, albeit in relatively small numbers. As with other forms of gambling, bingo has created self-imposed parameters becoming almost gender specific and in the process may have been alienating the potential male bingo player by basing their model entirely on a female bingo player. The same of course can be said for poker and casino sites which have until more recently targeted the male gambler and in the process made the prospective female players feel distanced from the product. More and more poker and casino sites in an attempt to add value are now specifically targeting the female player, and a few forward thinking online bingo sites are doing the same by gearing their product more towards the unisex market but the majority still see the female player as their target audience. A surprising factor when analysing the data obtained from the survey population is the average spend over gender, (see. Fig 1.1) of the 2,167 questioned only two of the ‘high rollers’ were male. The two male respondents who stated that they spent up to £1,000 per week both came from the North of England and were between the ages of 26 and 45. Another interesting insight was their reply to question 7. Do you tell your partner how much you spend playing bingo / other games online? Both replied that they couldn’t tell their partner the amount of money spent on online bingo. In contrast 50% of the female high rollers questioned could tell their partner exactly how much they spent on their bingo games, however the results are possibly skewed because of the lower recorded number of male players who are high spenders. In response to the question regarding the age of the survey participants, of the total Survey population 2,166 responded with only one respondent choosing to skip the question. 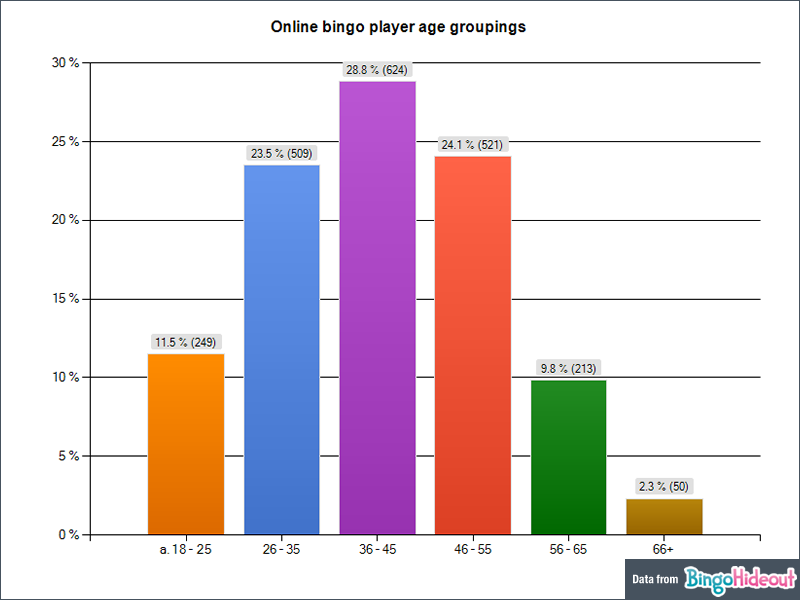 The table above shows the age range of the survey population and the various age groups participating in online bingo. Our table shows that 87.9% of the surveyed population of online bingo players are below the age of 55 with the 56 + age group accounting for 12.1%. The hypothesis therefore that 90% of online bingo players are below the age of 50 as stated on the Wikipedia site would therefore seem to have changed quite dramatically, meaning that possibly the 50+ market may have been overlooked by bingo sites as a key target audience. In fact surprisingly the 46 to 55 age group account for 24.1% of those surveyed which is higher than the 23.5% of the 26 to 35 age group. The correlation of the 46 to 55 age group and the higher percentage of participation figures as illustrated above – which we have already shown is higher than the 26 to 35 age group – could possibly be attributed to the availability of disposable income and /or more free time. The younger age group though still statistically high in respect of participation, are most likely to have family commitments which could limit the availability of both free time and disposable income. It is worth noting that over a third (36.2%) of the survey population that play at online bingo sites in the Bingo Hideout survey are over 46 years old, in contrast to the under 35 age group which accounts for 35% of the survey population. Certainly the ‘silver surfer’ is proving to be a significant market and bingo sites may be missing significant opportunities if they do not recognise the prospects that this age group presents. 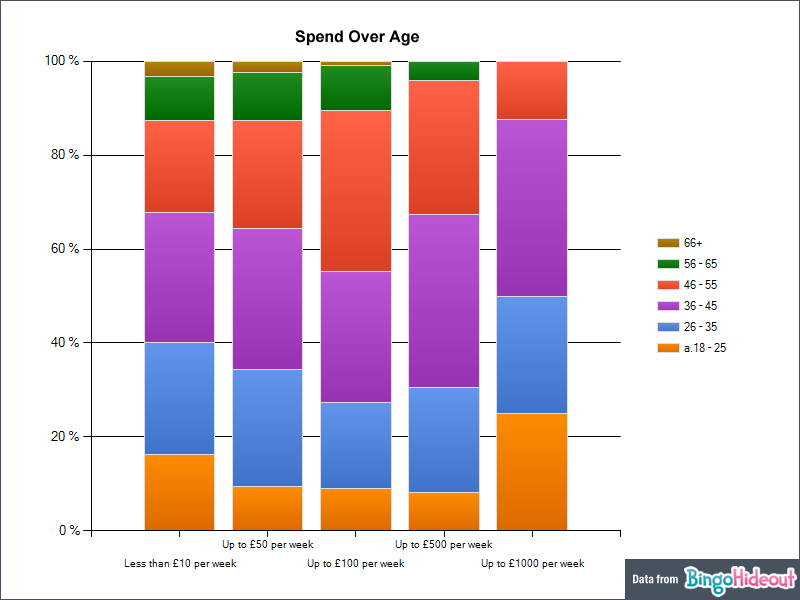 The spend over age group revealed some remarkable statistics (see fig 2.1), one of the most striking was the results for the 36 to 45 year age group, not only were this group the most likely to be the high rollers, spending over £100 and up to £1,000, but over 55% of those that recorded the higher spends stated that they were single. Of the higher spenders in this age group who stated they had partners, 61% said they would be entirely honest with their partners about the amount of money that they spent playing online bingo, 39% said they would tell their partner but would not tell them the exact amount they spent playing online bingo and of all those in this age group with partners none said that they would not tell their partner of their bingo spending. There were no players over the age of 55 who were spending in excess of £500 per week. The 46 – 55 age group were most likely to spend between £50 and £100, and the 55 to 65 year old age group were most likely to spend from £1 to £100 per week. 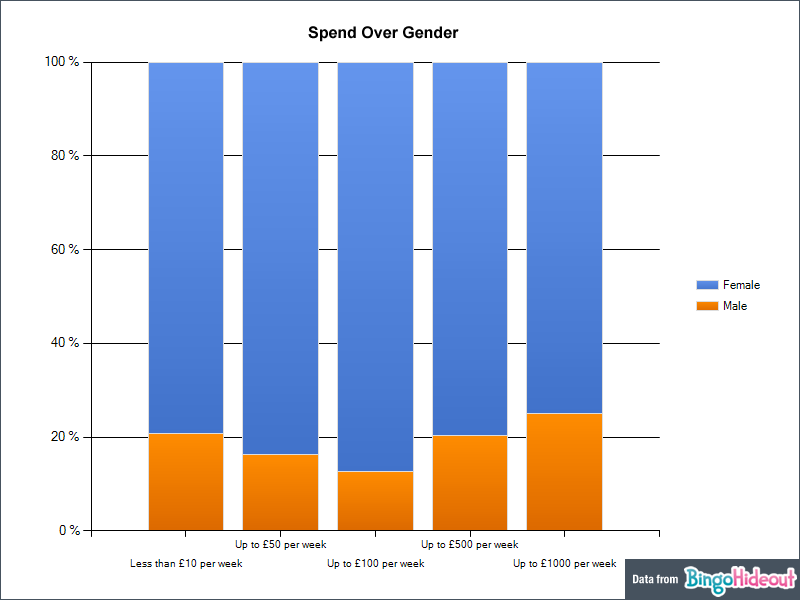 Another remarkable statistic was revealed for the 18 to 25 year old age group which showed that there was more likelihood of a spend of over £500 and up to £1,000 per week than there was to spend less than £10. Respondents to the Bingo Hideout survey were asked for details of their location, 2,160 of the survey population gave their location and 7 respondents chose to skip the question. The regional variations in the survey results seem to show that there is clearly a north / south divide. 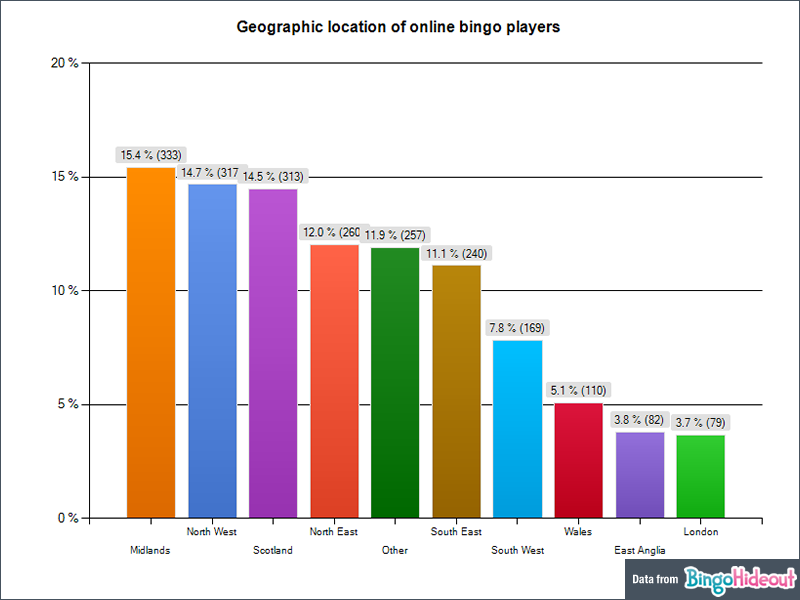 With the majority of the survey population of online bingo players being located in the Midlands 15.4% (333), North West of England 14.7% (317), Scotland 14.5% (313) and the North East of England 12% (260) with the lowest recorded results being London where only 3.7% (79) were domiciled. The quite dominant numbers of those online bingo players surveyed being resident in the Midlands and the North could be explained by factors such as cultural differences, those might include the preferred method of socialising and leisure time pursuits. The steeped in tradition Working Men’s club and traditional bingo hall has long been a socially constructed image of where people in the North of England might spend their leisure times, meeting with nearby close family and friends regularly. This perception is juxtaposition to the often ‘distant’ relationships and friendships that those who reside in London might experience, lifestyles can be altogether more transient and culturally diverse, social experiences might consist of nights out to meet work colleagues or friends in a wine bar or local restaurant, with relationships most likely not to be of a permanent nature and with few family members living nearby. The culture therefore of bingo could be deep seated in the psyche of residents in the North of England but not in those that are resident in London and surrounding areas. There could be a multitude of reasons behind the differences seen in the statistics, it could as likely be down to differences in locations where advertising and marketing has been prevalent by online bingo companies. Demographics could be another reason for the contrasting figures, such as the higher rate of blue collar workers in the North and the dominance of white collar workers in the South or possibly higher unemployment in the North of England which would allow more free time to pursue activities such as online bingo, but this theory could be discounted as there would not likely be sufficient disposable income to pursue such activities. There were 2,167 respondents to the Bingo Hideout survey, of those questioned 2,147 responded to question no.4 regarding frequency of online bingo play and 20 respondents chose to skip the question. The above pie chart shows clearly that almost half 48.3% (1,038) of the survey population play online bingo at least once a day. 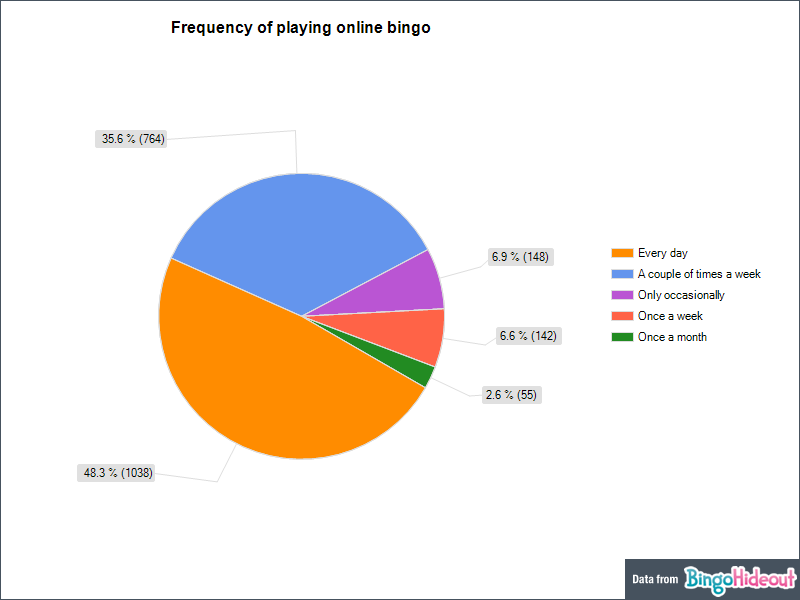 In total 764 (35.6%) of the survey population stated that they played approximately twice a week the remainder stating that they participated in online bingo games only occasionally 6.9% (148), once a week 6.6% (142) or once a month 2.6% (55). The conclusion from this evidence is that over ¾ of online bingo players participate in games at online bingo sites between 2 and 7 days per week. The Bingo Hideout survey explored the estimated winnings over a 12 month period, of the survey population 2,147 responded to question no. 5 on total winnings received and only 20 respondents chose to skip the question. The survey results showed that the majority of online bingo players 42.8% (919) in the previous year had wins of less than £100. 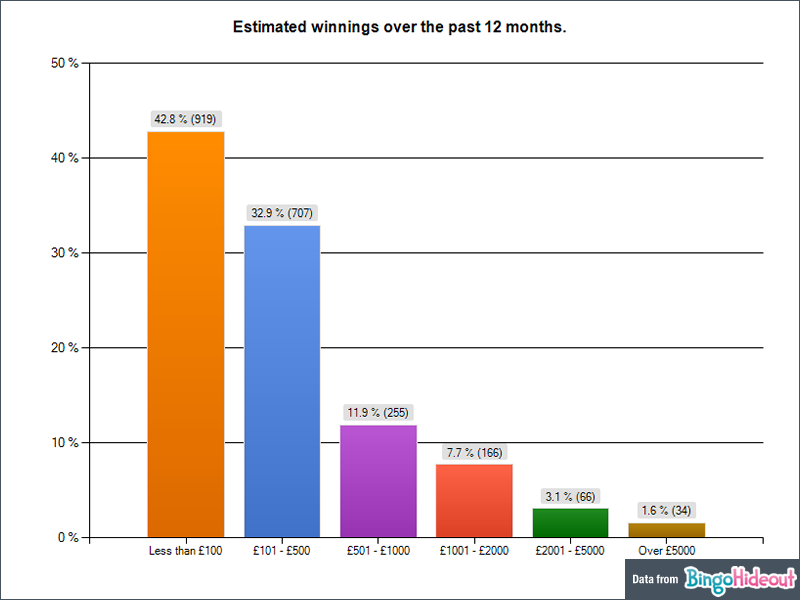 In total 32.9% (707) had larger wins of between £101 – £500, these two figures combined show that 75.7% or just over ¾ of online bingo players earned wins of between £1 – £500. The remainder of the survey population had fairly significant wins of between £501 – £5,000+ whilst playing online bingo which equates to just under ¼ of those surveyed receiving considerable prizes. 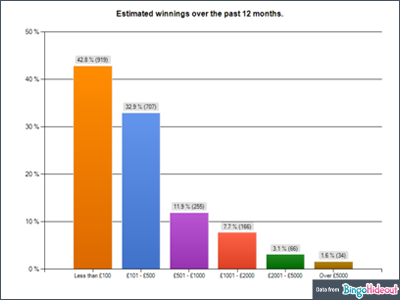 It is interesting to note that those that had winnings of £1001 to £5000+ whilst playing online bingo was greater at 12.4% (266) than those that had winnings of between £501 – £1000 at 11.9% (255). In response to the question regarding the estimated online bingo spend of the survey participants; of the total Survey population 2,147 answered the question asked with 20 respondents choosing to skip the question. 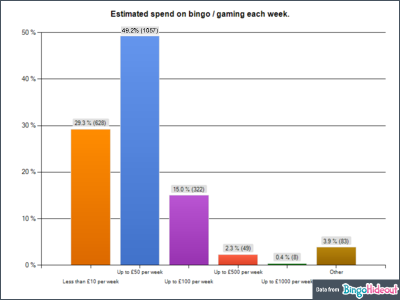 Of all the results one of the most startling statistics revealed by the Bingo Hideout survey is the estimated weekly spend on online bingo games by the respondents. The statistic show that the majority of online bingo players questioned spent more than £10 per week on online bingo. In fact the highest number of those questioned 49.2% (1,057); spend more than £50 per week on their online bingo games. This could possibly make the data on Wikipedia for the average monthly spend on online bingo games amongst players of around £120 as provided by Parlay incorrect. Quite surprisingly of those questioned in the Bingo Hideout survey a total of 379 players spent between £51 and £1000 per week on their online bingo games and for the 8 players who state that they pay up to £1,000 per week on online bingo games we have calculated that these 8 players alone could generate over £400,000 worth of income per year for the online bingo sites they play on. There was a hypothesis that the biggest spenders on bingo games (those players with an expenditure of more than £100 per week) would most likely be in the South of England due to London, Berkshire, Buckinghamshire and Oxfordshire having the highest Gross Domestic Product (GDP) per capita in the UK (London being no.1 with an estimated €71 338 GDP and Berks, Bucks and Oxon recorded as €40 937 GDP as shown in the Economy of England section on Wikipedia ). 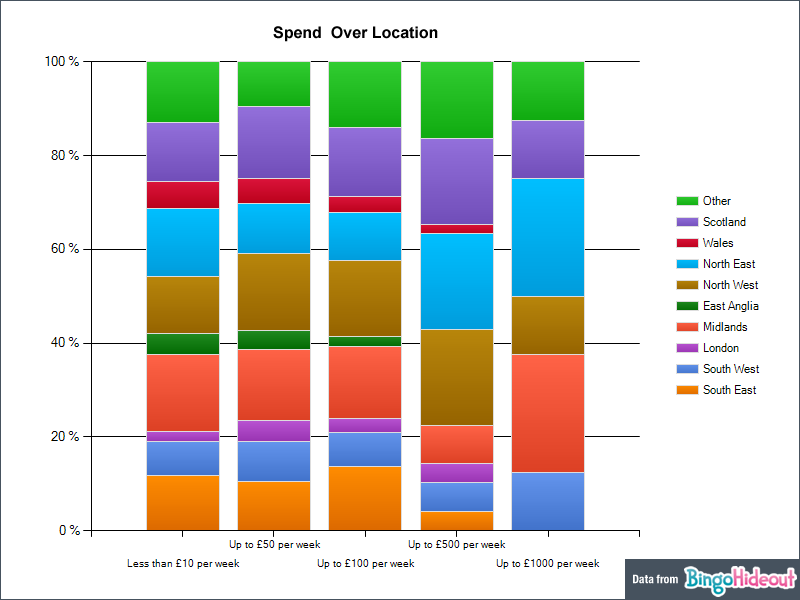 It was therefore felt that it would be beneficial to see if there was any correlation between the weekly spend and location of players, and surprisingly the data showed that London online bingo players did not register at all in total spends of over £500 per week and up to £1,000 per week, and although there were some players in the South East who spent sums up to £500 they were relatively small in number and there were none that spent up to £1,000 per week. There were no players recorded in East Anglia whose expenditure on online bingo was in excess of £100 per week, and no players from Wales who spent over £500 per week. Of the survey population respondents who were the highest spenders by geographic location in the UK, are actually located in the North East of England, with the North East and the Midlands bingo players most likely to spend £500 to £1,000. 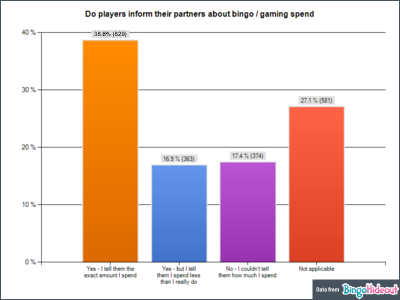 The Bingo Hideout survey asked the survey population whether they revealed information in respect of their online bingo and gaming spend to their partners. Of the total 2,167 Survey population, a total of 2,147 answered the question asked, with 20 respondents choosing to skip the question. The survey showed some surprising results in terms of honesty of gaming spend. In fact men proved to be the most likely to share information with their partner about the amount of money that they spent, with only one third of the women questioned stating that they shared the information with their partner. The differential in the quoted levels of honesty of course could be that the men questioned were in relationships with online bingo players, and as such they were both equally honest with each other in respect of expenditure. It would therefore be helpful to have information as to if those players questioned were in relationships with partners who participated regularly in online bingo or gaming, to ascertain if common interest was a factor in the levels of honesty. In terms of being honest, there is of course a vast difference between withholding information than there is to lying. Because an online bingo player may not divulge the information to a loved one does not necessarily mean that this is to deceive. Levels of honesty and privacy differ from relationship to relationship, some households choosing to keep money separate and others choosing to pool the household income, differences therefore may occur because of factors such as these. If those players questioned were in fact deliberately keeping secrets about their online bingo spend then this could be a worrying factor as this might possibly indicate a further underlying problem such as gambling addiction. Although it is felt that the most likely reason for withholding such information is because of possible partner disapproval, and with the survey showing that 25% of women admit to telling their partner they spend less than they actually do on playing online bingo games, then this hypothesis is most likely correct. Friedrich Nietzsche a 19th century philosopher believed that an untruth was preferable to the truth if the untruth was ‘life-advancing, life-preserving’ (see Wikipedia). Therefore if we apply this theory in relation to the lack of information given to some loved ones about the true amount of money spent on bingo games, it is likely that Nietzsche would uphold that the untruth would be preferable to the truth, as his belief would be that there would be no life enhancement achievable as a consequence of revealing the ‘real’ truth. Of course 19th century philosophers do not have a true place in any assumptions on modern morality, but the key factor here might be that the withholder of the information is seeking to maintain an aspect of power and control in respect of their online bingo habits. By choosing to withhold the information, the online bingo player has exerted their own personal choice over whether the revelation is made this in effect gives a feeling of power and control. Respondents to the Bingo Hideout survey were asked if they participated in online bingo forums and chat rooms, of those questioned 2,136 of the survey population replied to the question on bingo and chat room participation with 31 respondents choosing to skip the question. In response to the question regarding participation in online bingo forums and chat rooms, the results of the Bingo Hideout survey showed that the majority of online bingo players do participate actively in the social side of the online bingo sites. A total of 1,467 of the survey population said that they did participate in the chat rooms and forums which is 68.7% of the respondents, however 31.3% (669) did not participate in the chat rooms. Various reasons why players did not participate in chat room and forums where given by those questioned, with answers ranging from ‘the chat is too fast’, ‘I don’t know how to use them’, ‘players chatting already know each other’ or ‘I am too shy to chat’ to ‘I just like to read and not join in’ and ‘I don’t like chat rooms’. Sadly for what is known as a very sociable pastime one online bingo player said ‘I very rarely use chat rooms because I feel that I get ignored in a lot of them, I’ve even complained a few times and I don’t even get a reply’. This comment is very rare as most of the respondents just stated that they just chose not to join in. One particular online bingo player summing this up with the following statement ‘I’m not a chatty person myself, but I certainly enjoy reading the banter from other roomies! I get a great laugh!!’. The Bingo Hideout survey asked the survey population whether friendships had been formed through their participation in online bingo site chat rooms. Of the total 2,167 Survey population, a total of 2,143 answered the question asked regarding friendships, with 24 respondents choosing to skip the question. The survey population were asked if they had formed friendships as a result of their participation in online bingo chat rooms. As many as 47% (1007) said that they had made new friendships whilst 38.3% (820) said that they had not made new friends, a much smaller proportion 14.7% (316) said they didn’t know if new friendships were formed. One possible reason for those stating that they didn’t know if they had made new friends could be that they are new online bingo players and that they may not yet know if the friendships they are establishing will last. Of the respondents to the Bingo Hideout survey who had formed new friendships, common comments were; ‘found some lovely friends’, ‘have made friends from all over the world’, ‘friends to share problems with’, ‘new friends have eased loneliness’ or ‘lots of friends to chat to so no longer bored’. There were some surprising comments too such as ‘I met my husband in a chat room’, in fact their were a fair amount of ‘romantic’ relationships that respondents stated had been formed as a result of participation in chatrooms and was a very common theme throughout the survey results. Many of the respondents said that new friends had helped them come to terms with illness, disability and even death of a loved one, proving that chat rooms are a valuable networking service for online bingo players. One lady who is deaf said that for the first time she is able to communicate with everyone because everyone understands her. The results show that the friendships formed in the chat rooms are useful for many people and feelings of loneliness and isolatation are a recurring theme throughout the survey comments. Another very common feeling is happiness and laughing, however one person said the ‘people are always whinging’ on the bingo sites. Many of the respondents had good fortune such as getting a new job or finding a long lost relative or friend and even sold a house. The Bingo Hideout survey population were asked to state one thing that they would change about their lives, of the total 2,167 survey population, a total of 2,082 answered the question asked, with 85 respondents choosing to skip the question. Many of the respondents stated ‘all of the options’ given would be their preference. A sizeable proportion said that they wouldn’t change a thing and that they were happy as they were. It was surprising that the main motivation for playing online bingo was not to increase wealth for almost 47% of the survey population, most online bingo sites offer large jackpot prizes and one would therefore assume that players would all wish to win a big prize. 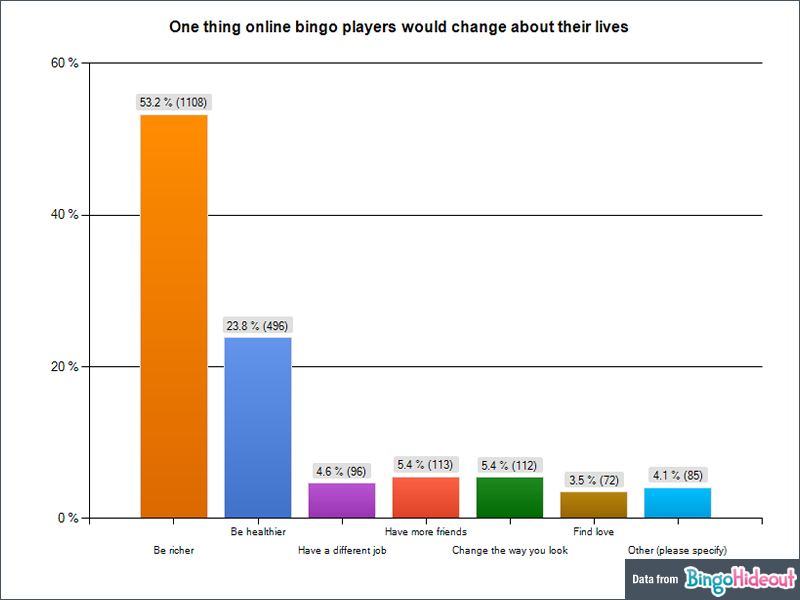 The fact that almost a quarter of those that responded to this question would prefer to be healthier, suggests that many players participate in online bingo because of their inability to participate in other forms of leisure pursuits due to their ill health, it is therefore possibly the reason why most of those that would wish for better health had average spends of up to £50 per week. ‘I thought this survey was going to be short? lol’ – Bingo Hideout apologise.